Any one know who Ohio State plays next? When the Buckeyes line up against the Wolverines Saturday, they'll do so with an elite list of recruits watching ... most of whom have had Nov. 24 circled on their calendars for quite some time now. Some are current Ohio State commits, some have committed elsewhere and some have yet to pledge their services to a university. 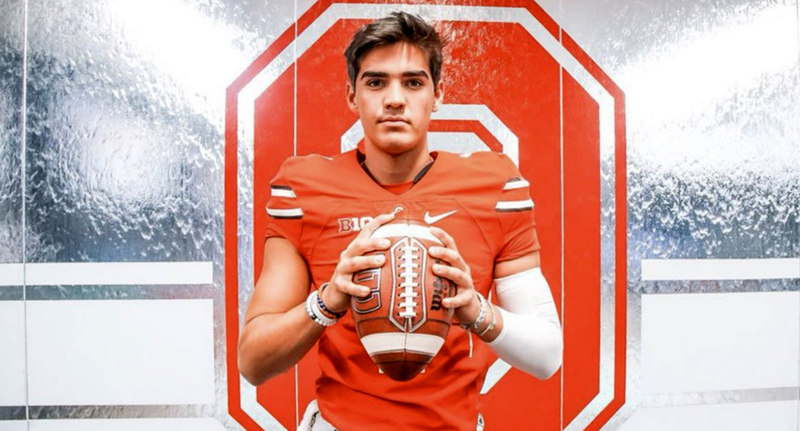 In the Buckeyes' '19 Dynasty recruiting class, Lexington's Cade Stover and Blessed Trinity Catholic's Steele Chambers plan to be on hand while St. Xavier's Paris Johnson Jr. and Chaparral's Jack Miller plan to represent Ohio State's 2020 recruiting class. Those names could be crucial in landing a commitment or flipping a commit this weekend. We all know the impact that Johnson Jr. has had on the recruiting trail. He'll have help this weekend on the sidelines ... and not from just the coaching staff. As for committed prospects in which Ohio State is hoping to flip, Toledo Whitmer's Cavon Butler will be on an official visit. Butler is already committed to Kentucky but has been in frequent contact with coaches Larry Johnson and Urban Meyer. 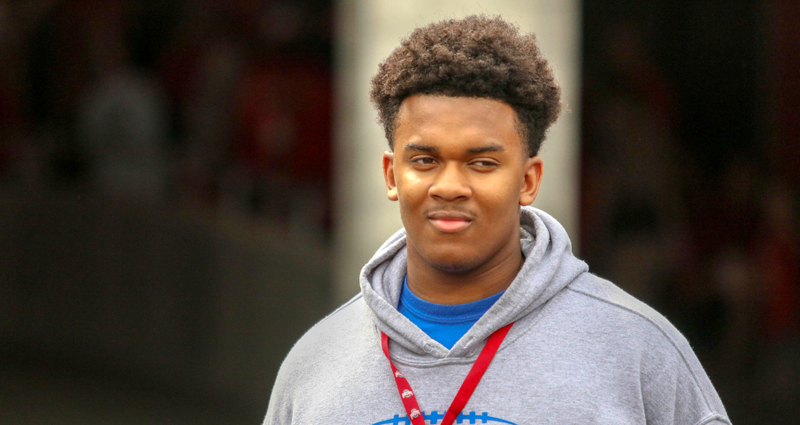 He'd be a big get for the class of 2019, considering the Buckeyes haven't yet claimed a defensive tackle in the cycle. Ohio State commit Paris Johnson Jr. will attend Saturday's game against Michigan. Cornerback Renardo Green, who is committed to Florida State, will also be taking an official visit. The three-star 2019 prospect is ranked as his class' 46th-best at his position. In-state linebackers Jestin Jacobs and Tommy Eichenberg will be making unofficial visits. Jacobs is committed to Iowa while Eichenberg has pledged to Boston College. Out of the two, Eichenberg has been rumored to be more likely to flip. If Ohio State could somehow land both, which isn't impossible, the 2019 class would get a huge, much-needed shot of momentum. As for uncommitted prospects who plan to visit ... well, there's a ton of them. In the class of 2019, the list includes Christ the King Regional's Jared Harrison-Hunte, Warren Central's David Bell and McDonogh School's D'Von Ellies will all take official visits. As of now, Penn State is said to have the lead for Harrison-Hunte and Ellies while Purdue is thought of as the leader for Bell. Those are, of course, projections. Anything could happen. In 2020, Southern Columbia five-star receiver Julian Fleming and St. John's five-star linebacker Mekhail Sherman are to be expected. Sherman's teammates, four-star receiver Rakim Jarrett and four-star defensive tackle Tre Williams, will accompany him. Those three will be joined by Ferndale (Wa.) guard Geirean Hatchett, Dublin Coffman all-purpose back Michael Drennen II, Oak Park (Mich.) receiver Maliq Carr, Bay City (Mich.) receiver Devell Washington, Sandy Creek (Ga.) safety Brian Branch and Trotwood-Madison cornerback Sammy Anderson. In the class of 2021, in-state recruits Jack Sawyer (Pickerington North) and Lorenzo Styles Jr. (Pickerington Central) are also expected to make the short trip. As the list continues to inevitably grow, we'll make sure to keep you updated this week on who's going to be in Columbus Saturday as the Buckeyes prepare for their most important recruiting weekend of the year. Way back on Oct. 25, Chaparral (Az.) quarterback Jack Miller announced he'd be ending his junior season early due to a knee injury he suffered on Oct. 12. Since that time, Miller has worked hard to get healthy after throwing for 2,431 yards and 27 scores this past fall. Jack's father, Jack, discussed his son's rehabilitation and the expectations he has heading into his last high school football season. "Jack began core and upper body workouts this past week," Miller told Eleven Warriors. "Since his season is over, he is taking it slow. He is lean and focused. [Next season], he is looking forward to the opportunity for Chaparral to develop as a state contender, with him back leading the team. The team lost its last four games when he was hurt and out. That was difficult. Next year he has the chance to break the school record for yards passing [in a single season] and was well on the way this year." Miller also mentioned that his son has over 8,000 career passing yards at the high school level and the Arizona state record for career passing yards is just over 11,000. That's another goal of his. The Miller family, like many other families, will be in Columbus this weekend to attend Ohio State's home game against Michigan, set for a noon kickoff. "This is the first time my entire family is there for multiple nights, and the schedule will give us time to see a bit more of Columbus," Miller said. "Jack attended the Penn State game last year but I was having heart surgery so it's the first game for the family. This is a chance for all to get a look where Jack will be for the next several years." When asked what the biggest factor in Jack's choosing of Ohio State was, Miller said the level of competition, the offense the Buckeyes run and the quality of coaches the program has on staff all factored into the decision. "Jack has always wanted to play for a team that could compete for a national title ... OSU is one of those teams," he said. "As well, it's a program that has an explosive offense, taking advantage of [Jack's] ability to throw and run. Academics, and life after football were critical especially. OSU's development of athletes for the business world, quality coaching and the commitment to develop him as a responsible man [all played a part]."